Snrky: Real weeds are fortunate in that they don't know they're being pruned. Real weeds are fortunate in that they don't know they're being pruned. Maybe it's a trend among many different fields of work, but one thing I've noticed about professional development books for managers is that they tend to rely rather heavily, sometimes to the detriment of the point, on metaphor. That's not to say they're aren't plenty of great books ou there (insert top 100 list here), but if you analyze the trend by asking the question, "Does art imitate life or...? ", it makes you wonder - do "management books" rely on metaphor because that's how the authors of said book(s) want you to view your employees (i.e. - as things easy to "put in a box", cynically-speaking) or are employees actually so, and simply make it irresistible for an author not to rely so heavily on metaphors. Maybe they're all just playing their part. Title: Real weeds are fortunate in that they don't know they're being pruned. Snarky: He gave me some book to read about treating your workplace like a garden. 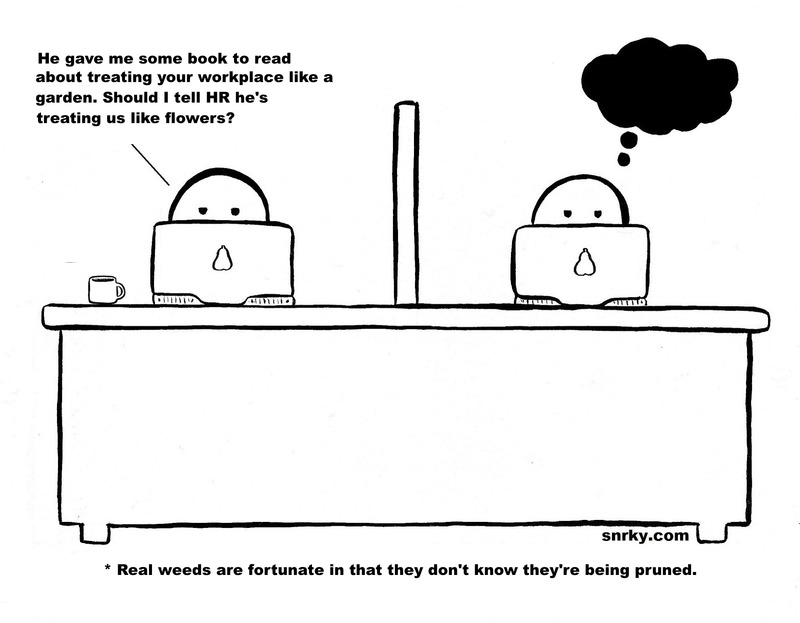 Should I tell HR he's treating us like flowers?